- Tri-State Heavyweight Title Tournament (September 7, '80) = Koko B. Ware fell to Karl Kox. Terry Gibbs won the tournament. - Memphis Southern Tag Title Tournament (March 14, '82) = Sweet Brown Sugar & Bobby Eaton won over Roy Rogers & Joe Stark, Dutch Mantel & Ric McCord and Stan Lane & Robert Gibson to win the tournament. - Memphis Lawler/Kaufman (April 5, '82) = Sweet Brown Sugar & Bobby Eaton beat Robert Gibson & Steve Keirn. - Mid-America Title Tournament (February 14, '83) = Sweet Brown Sugar defeated Sabu and Jessie Barr, then lost to Bobby Eaton in the finals. - Memphis Southern Tag-Team Title Tournament (January 31, '84) = The Pretty Young Things (Koko B. Ware & Norvell Austin) beat Rick Rude & Terry Gibbs in the semi-finals, then fell to the Sambuie Express in the finals. - Georgia National Tag Team Title Tournament (May 20, '84) = Sweet Brown Sugar & the Junkyard Dog beat Tully Blanchard & Tommy Rogers and Ted DiBiase & the Spoiler, before losing to the Road Warriors in the finals. - WCCW Labor Day Star Wars '84 (September 3) = The Pretty Young Things lost, via DQ, to Iceman King Parsons & Skip Young. 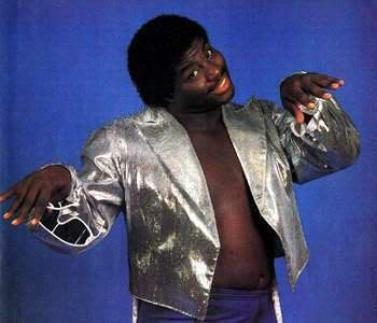 - WCCW 1st Cotton Bowl Extravaganza (October 7, '84) = Koko B. Ware fell to Buck Zumhoffe. - WCCW Thanksgiving Star Wars '84 (November 22) = The Pretty Young Things lost to the American Tag-Team Champs, the Fantastics. - Memphis Southern Tag-Team Title Tournament (June 17, '85) = The Pretty Young Things lost in the first round to Jerry Lawler & Nick Bockwinkle. The Fabulous Ones won the tournament. - Mid-America Title Tournament (August 12, '85) = Koko B. Ware beat the Master Blaster, Ron Sexton, the Spoiler and Bota the Witch Doctor to win the tournament. - Memphis Southern Tag-Team Title Tournament (January 13, '86) = Koko B. Ware & Rick Casey lost in the first round to the Sheepherders. The Fantastics won the tournament. - Mid-South Superdome Extravaganza (June 14, '86) = Koko B. Ware fought to a Double Disqualification with Jack Victory. - WWF Saturday Night's Main Event #8 (November 15, '86) = Koko B. Ware pinned Nikolai Volkoff. - WWF Saturday Night's Main Event #10 (February 21, '87) = Koko B. Ware competed in a "Battle Royal", which was won by Hercules. - WWF Wrestlemania III (March 29, '87) = Koko B. Ware fell to Butch Reed. - WWF Saturday Night's Main Event #14 (December 7, '87) = Koko B. Ware was forced to submit to Greg Valentine. - WWF Wrestlemania IV (March 27, '88) = Koko B. Ware & the British Bulldogs lost to Bobby Heenan, Haku & Tama. - WWF SummerSlam '88 (August 29) = Koko B. Ware was beaten by the Big Boss Man. - WWF Saturday Night's Main Event #16 (April 22, '88) = Koko B. Ware fell to Rick Rude. - WWF Survivor Series '88 (November 24) = Koko B. Ware, Hulk Hogan, Randy Savage, Hillbilly Jim & Hercules fought in an "Elimination" Match against Ted DiBiase, Haku, the Red Rooster & the Twin Towers. Koko was eliminated by the Big Boss Man. Hogan & Savage "survived". - WWF Saturday Night's Main Event #19 (December 7, '88) = Koko B. Ware was pinned by Mr. Perfect. - WWF Royal Rumble '89 (January 15) = Koko B. Ware competed in the Royal Rumble, which was won by John Studd. - WWF London Arena (October 10, '89) = Koko B. Ware pinned Boris Zhukov. - WWF Royal Rumble '90 (January 21) = Koko B. Ware competed in the Royal Rumble, which was won by Hulk Hogan. - WWF Wrestlemania VI (April 1, '90) = Koko B. Ware fell to Rick Martel. - WWF Saturday Night's Main Event #28 (September 18, '90) = Koko B. Ware was forced to submit to Sgt. Slaughter. - WWF Survivor Series '90 (November 22) = Koko B. Ware, Dusty Rhodes & the Hart Foundation competed in an "Elimination" Match against Ted DiBiase, the Undertaker & Rhythm & Blues. Koko was eliminated by the Undertaker. DiBiase was the sole 'survivor'. - WWF Royal Rumble '91 (January 19) = Koko B. Ware was pinned by the Mountie. - WWF Wrestlemania VII (March 24, '91) = In a dark match, Koko B. Ware took down the Brooklyn Brawler. 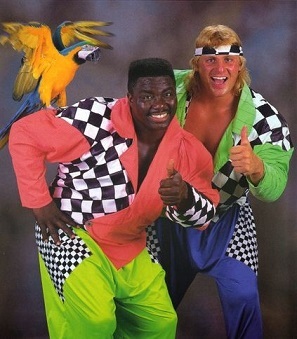 - WWC 18th Anniversary Show (July 6, '91) = Koko B. Ware beat Galen Mendoza. - WWF SummerSlam '91 (August 26) = In a dark match, Koko B. Ware won over Kato. - USWA Star Wars (September 2, '91) = Koko B. Ware & Robert Fuller were beaten by Awesome Kong & the Bruiser. - USWA Mid-South Coliseum (September 9, '91) = Koko B. Ware & Jimmy Valiant won over Awesome Kong & the Bruiser. - USWA Mid-South Coliseum (September 16, '91) = Koko B. Ware defeated Reggie B. Fine. - USWA Mid-South Coliseum (September 30, '91) = Koko B. Ware fought to a No-Contest with the USWA Unified World Champ, Jeff Jarrett. - USWA Mid-South Coliseum (January 6, '92) = Koko B. Ware pinned Tony Falk. 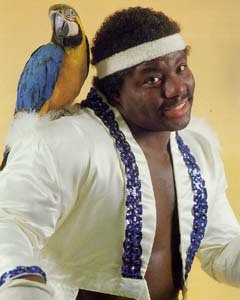 Later on, Koko B. Ware won a "Battle Royal". - USWA Mid-South Coliseum (January 13, '92) = Koko B. Ware took down Tony Anthony. - USWA Mid-South Coliseum (January 20, '92) = Koko B. Ware fought to a Double Countout with Kimala. - USWA Mid-South Coliseum (January 25, '92) = Koko B. Ware won over Doug Masters, Bull Pain and Tom Prichard to earn the #1 Contenders spot. - USWA Mid-South Coliseum (February 2, '92) = Koko B. Ware fought to a Double Disqualification with the USWA Unified Champ, Kimala. The title was held up as a result of the match. - USWA Mid-South Coliseum (February 10, '92) = Koko B. Ware lost to Kimala, who gained the vacated USWA Unified World Title. - USWA Mid-South Coliseum (February 16, '92) = Koko B. Ware lost, via DQ, to the USWA Unified Champ, Kimala. - USWA Mid-South Coliseum (February 24, '92) = Koko B. Ware won the USWA Unified World Title, beating Kimala. - USWA Mid-South Coliseum (March 2, '92) = Koko B. Ware retained the USWA Unified World Championship, winning over Kimala. - USWA Mid-South Coliseum (March 9, '92) = Koko B. Ware, Jerry Lawler & Kimala won, via DQ, over Richard Lee & Moondogs Spot & Spike. - USWA Mid-South Coliseum (March 16, '92) = Koko B. Ware lost the USWA Unified World Title to Kimala. - USWA Mid-South Coliseum (March 30, '92) = Koko B. Ware was defeated by the USWA Unified World Champ, Kimala. - WWF Survivor Series '92 (November 25) = High Energy (Koko B. Ware & Owen Hart) were beaten by the Headshrinkers. - WWF Royal Rumble '93 (January 24) = Koko B. Ware competed in the Royal Rumble, which was won by Yokozuna. - USWA Mid-South Coliseum (April 5, '93) = Koko B. Ware beat Wolfie D.
- USWA Mid-South Coliseum (April 12, '93) = Koko B. Ware lost, via DQ, to Brian Christopher. - USWA Mid-South Coliseum (April 19, '93) = Koko B. Ware won, via DQ, over Scotty Flamingo. - USWA Mid-South Coliseum (April 26, '93) = Koko B. Ware won, via DQ, over Brian Christopher. - USWA Mid-South Coliseum (May 3, '93) = Koko B. Ware won, via DQ, over Brian Christopher. - USWA Mid-South Coliseum (May 10, '93) = Koko B. Ware & Frank Morrell defeated Brian Christopher & Frank Hickey. - USWA Mid-South Coliseum (May 17, '93) = Koko B. Ware & Jerry Lawler lost to the USWA Tag Champs, Rex King & Steve Doll. Later on, Koko & Lawler won a "Tag-Team Battle Royal". - USWA Mid-South Coliseum (May 24, '93) = Koko B. Ware & Jerry Lawler fell to the USWA Tag Champs, Rex King & Steve Doll. - USWA Mid-South Coliseum (September 20, '93) = Koko B. Ware beat the Rock 'n' Roll Phantom. - USWA Mid-South Coliseum (October 18, '93) = Koko B. Ware & Miss Texas fell to Brian Christopher & Toni Adams. - USWA Mid-South Coliseum (October 25, '93) = Koko B. Ware & Doink the Clown lost, via DQ, to Jeff Jarrett & Brian Christopher. - USWA Mid-South Coliseum (November 1, '93) = Koko B. Ware & Rex Hargrove won the USWA Tag Titles from Jeff Jarrett & Brian Christopher. - USWA Mid-South Coliseum (November 8, '93) = Koko B. Ware & Rex Hargrove lost the USWA Tag Titles to Jeff Jarrett & Brian Christopher. - USWA Mid-South Coliseum (November 15, '93) = Koko B. Ware & Rex Hargrove lost, via countout, to Jeff Jarrett & Brian Christopher. - USWA Mid-South Coliseum (November 22, '93) = Koko B. Ware & Rex Hargrove were beaten by Jeff Jarrett & Brian Christopher. - USWA Mid-South Coliseum (January 17, '94) = Koko B. Ware lost, via DQ, to the USWA Champ, Brian Christopher. - USWA Mid-South Coliseum (January 24, '94) = Koko B. Ware lost, via DQ, to the W*ING Junior Heavyweight Champ, Mike Anthony. - USWA Mid-South Coliseum (January 31, '94) = Koko B. Ware defeated Dutch Mantell. - USWA Mid-South Coliseum (February 7, '94) = Koko B. Ware beat Jeff Gaylord. - USWA Mid-South Coliseum (February 14, '94) = Koko B. Ware fought to a Draw with Robert Gibson. - USWA Mid-South Coliseum (February 21, '94) = Koko B. Ware lost, via DQ, to Robert Gibson. - USWA Memphis Memories (March 7, '94) = Koko B. Ware pinned Billy Travis. Later on, Koko B. Ware lost an "Elimination" Match to Jerry Lawler. Brian Christopher, Austin Idol, Jimmy Valiant, Terry Funk, Tommy Rich, Eddie Gilbert, Doug Gilbert & Moondog Spot were the other participants. - USWA Mid-South Coliseum (March 14, '94) = Koko B. Ware lost, via DQ, to Robert Gibson. - AWF Heavyweight Title Tournament (November '94) = Koko B. Ware competed in the tournament, which was won by Tito Santana. - AWF Tag-Team Title Tournament (May '95) = Koko B. Ware & Tony Atlas beat the Super Destroyers, Fidel Sierra & Ron Powers, and another team, then lost in the finals to Tommy Rich & Greg Valentine. - USWA Mid-South Coliseum (December 4, '95) = Koko B. Ware lost, via DQ, to the USWA Champ, Tex Slazenger. - USWA Mid-South Coliseum (December 27, '95) = Koko B. Ware won a "Hair vs. Hair" Match over the Smokey Mountain Massacre. - Mid-South A Fight For A King (November 29, '03) = Koko B. Ware lost a "Loser Wears A Chicken Suit" Match, via DQ, to Reggie B. Fine. - Mid-South Memphis Slam Jam (April 23, '04) = Koko B. Ware won an "I Quit" Match over Kevin White. - Mid-South Throwback Night II (August 28, '04) = Koko B. Ware & Kamala defeated Kevin White & Bill Dundee. - Mid-South Throwback Night III (October 30, '04) = Koko B. Ware won a "Stun Gun On A Pole" Match over Brian Christopher. - Mid-South Throwback Night IV (December 26, '04) = Koko B. Ware pinned Stan Lee. - Mid-South Throwback Night V (February 26, '05) = Koko B. Ware & Kid Kash fell to Brian Christopher & Shock. - Mid-South Throwback Night VI (April 16, '05) = Koko B. Ware & Soultaker lost a "Triangle" Match to Private Precious & Reggie B. Fine. Kevin White & Johnny Dotson were the other participants. - World Wrestling Legends PPV (March 5, '06) = Koko B. Ware defeated the Disco Inferno. - WWE Wrestlemania XXV (April 5, '09) = Koko B. Ware was inducted into the WWE Hall of Fame. - IWC Night of Legends '10 (April 10) = Koko B. Ware took down Lanny Poffo.